Following the Governments health reforms in 1991 rationing has been put firmly on the agenda. This book identifies and clarifies the numerous political and ethical issues surrounding rationing in healthcare. Drawing upon international examples it offers a critical overview of the approaches to rationing and makes practical proposals for its management. 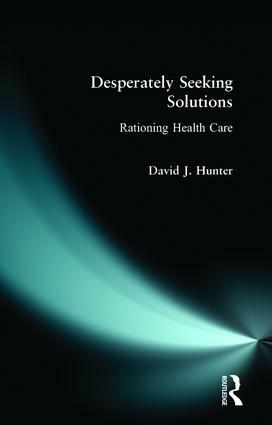 Desperately Seeking Solutions challenges the assumption that all health services are inherently subject to rationing as demand invariably outstrips supply and examines this within a comparative framework. The author critically evaluates the extent to which rationing has always existed and should exist within the NHS, although until recently it operated on an implicit rather than explicit basis and was bound up with clinical judgements rather than purely financial considerations. The author questions whether calls for explicit rationing are actually desirable and potentially feasible. PART ONE: THE DILEMMA OF RATIONING HEALTH CARE: ORIGINS AND DEFINITIONS. PART TWO: THE HEALTH CARE RATIONING DEBATE IN THE UK: A REVIEW. PART THREE: HEALTH CARE RATIONING: LESSONS - LEARNING AND FUTURE PROSPECTS.